fter discussing dilutions and succussions, how remedies work on an energetic level, and how there is no original substance from the original plant/animal/mineral source in homeopathic remedies, I find that clients invariably ask the same question: "So how exactly are these remedies made anyway?" Patients are willing to take remedies on faith, but they do want to know exactly what they are taking. From experience I have found that the process does not lend itself well to a verbal explanation, at least not to my inadequate attempts to do so, because clients do tend to broach the same topic on subsequent visits. The difficulty of getting one's head around how this process works is one that I can easily relate to. Even after considerable study to memorize the technique for exams, I still found that I did not fully understand how trituration, dilution and succussion worked to gradually enhance the healing power of a substance. What follows is a step-by-step description of the process, called dynamization or potentization. Reputable manufacturers of homeopathic remedies follow the same steps without cutting any corners. The only difference is that now modern machinery does much of the work that used to be done laboriously by hand. substance and/or releases innate healing power in the substance" (Yasgur). information from one substance to another" (Yasgur). Obtain milk sugar of that especially pure kind that is crystallized on threads and comes to us in the form of round bars. Put one third of 100 grains of powdered milk sugar in a glazed porcelain mortar, the bottom of which has been roughened by rubbing it with fine, moist sand. Put 1 grain of the powdered medicinal substance to be triturated on top of the powdered milk sugar. Mix the medicine and the powder with a porcelain spatula for a moment. 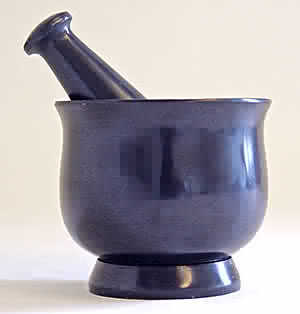 Triturate the mixture rather strongly for 6 to 7 minutes, using a porcelain pestle that has been rubbed dull. For 3 to 4 minutes, thoroughly scrape the mass from the bottom of the mortar and from the pestle, to make it homogeneous. Continue the trituration (as described in step 5) for another 6 to 7 minutes. Scrape the mass (as described in step 6) for another 3 to 4 minutes. Add the second third of the milk sugar. Add the last third of the milk sugar. Put the powder in a well-corked vial that protects it from sunlight and daylight. Label the vial with the name of the substance and the number 1/100 (to indicate the first centesimal trituration, 1C). Mix 1 grain of the 1/100 powder with 1/3 of 100 grains of powdered milk sugar. Label the vial with the name of the substance and the number 1/10,000 (to indicate the second centesimal trituration, 2C). Mix 1 grain of the 1/10,000 powder with one third of 100 grains of powdered milk sugar. Label it with the name of the substance and the number 1/1,000,000 (to indicate the third centesimal trituration, 3C). Each grain of this powder contains one millionth of a grain of the original substance. Each of these three trituration procedures takes one hour... These are the three degrees of dry powder trituration which, if well executed, make a good beginning towards developing the power (dynamization) of the medicinal substance. Dissolve 1 grain of the triturated powder (i.e., the substance triturated to the one-millionth attenuation) in 500 drops of a mixture that is 1 part brandywine (90 proof grain alcohol) and 4 parts distilled water. Place a single drop of this mixture in a vial. Add 100 drops of a good wine spirit (90 proof grain alcohol) to the vial. Give the tightly corked vial 100 strong succussions with the hand against a hard but elastic body, such as a leather-bound book. This is the first degree of dynamization. Thoroughly moisten fine sugar globules with this liquid. Rapidly spread the sugar globules on blotting paper to dry. Store the globules in a tightly stoppered little vial with the sign of the first degree of potency. Protect the bottle from heat and daylight. Take 1 globule of the medicine potentized to the first degree (LM1) and put it in a new vial (with a drop of water in order to dissolve it). Follow steps 3-8 above, labeling the bottle with the sign of the second degree of potency. Continue the above procedure until the dissolved globule of the 29th degree of potency has formed a spiritized medicinal fluid with 100 drops of wine spirit, by means of 100 succussions, whereby globules that are moistened with this and dried are labeled the 30th degree of dynamization. Only when crude medicinal substances are processed in this way, does one obtain preparations that have attained their full capability to aptly touch the suffering parts of the sick organism... By means of this mechanical processing (provided it is properly executed, as specified above) a given medicinal substance which, in its crude state, is only matter (in some cases, unmedicinal matter) is subtilized and transformed by these higher and higher dynamizations to become a spirit-like medicinal power. An intriguing aspect of homeopathic remedies is that, when potentized, they no longer obey ordinary chemical laws. One can never predict what rabbit will pop out of the hat when a new, experimental remedy is prepared. The only way to ascertain its unique healing properties is to exhaustively test the prospective remedy in various potencies on healthy individuals (i.e., a proving). I would like to conclude this section on remedies by sharing a very simple and elegant teaching experiment devised by John Sommerton, an instructor at the Toronto School of Homeopathic Medicine and a practicing homeopath in London ON, that illustrates the above concept. I have personally conducted this experiment with my class and the results have been consistently the same over many trials. Since it has been replicated many times, I can vouch for the reliability of the results. Line up 24 empty 1 dram remedy bottles. Place one drop of Acetic Acid (pure white vinegar) in the first bottle, add 9 drops of distilled water, and succuss 40 times. Take one drop from the first bottle and place it in the second bottle. Add 9 drops of distilled water and succuss 40 times. Repeat this process until you reach the 24th bottle, at which time you have a 24X potency. A 24X dilution is the point at which one reaches Avogadro's number, i.e., where there is not a single molecule of the original vinegar in the dilution. Now recall that pH is a measure of acidity and alkalinity. The lower the number, the more acidic the liquid being tested. The above readings indicate that the 24X dilution made from acetic acid has less acidity than distilled water! No chemist could have predicted this result beforehand. In fact, logical reasoning would lead one to assume that a dilution made from a strong acid would have more acid properties than pure water. But the remedy (for it is truly a remedy now) was not just diluted. It was potentized by serial dilutions and succussions. When substances, even inert ones such as silica, are homeopathically potentized, the normal rules of chemistry go out the window. Acetic Acid is a homeopathic remedy. Just for fun let us see what the Materia Medica has to say about its symptom complex when healthy provers took it and what ailments for which it has been found to be useful clinically. The information goes on for several pages, so I will only note a few items. This drug produces a condition of profound anaemia, with some dropsical symptoms, great debility, frequent fainting, dyspnoea, weak heart, vomiting, profuse urination and sweat. Haemorrhage from any part. Acet-ac. has the power to liquefy albuminous and fibrinous deposits. Epithelial cancer, internally and locally. Emaciation, esp. of face, hands and thighs. Great prostration: after injuries; after surgical shock; after anaesthetics. General: worse for cold drinks; lie like a load on the stomach. Haemorrhages after labour. Oedema of feet and legs; with diarrhoea. Intellect clouded, can hardly express herself..."
(Frans Vermeulen, Concordant Materia Medica, 3rd. ed., 2000).